Two years in the making, months of planning and an iconic dress restored to its former glory just in the nick of time. – Of course I’m talking about the arrival of the hotly anticipated Yves Saint Laurent: Style is Eternal exhibition to The Bowes Museum. Business Partner and one time life partner of Saint Laurent, Pierre Bergé arrived in County Durham on Wednesday ahead of the exhibition’s launch accompanied by staff from his Fondation Pierre Bergé – Yves Saint Laurent, and long standing friend of the pair, Baroness Helene Ludinghausen. At 89, Bergé is still very much the lifeblood of the Fondation he so painstakingly created in order to preserve the legacy of Saint Laurent. He admits that still now, he is surprised when he comes across something in the archives that he had forgotten about and how Saint Laurent’s genius is apparent in everything he ever created. Bergé had a reputation for being cold and hard in the days of the Yves Saint Laurent house of couture, and when Saint Laurent died in 2008 this appeared to soften him. At the press conference for Style is Eternal, Bergé was surprisingly open and frank in sharing his love for Saint Laurent. “(Saint Laurent) was very, very nice. Very nice. He loved people, his family and his staff were important to him and he loved them. It’s difficult to understand. He was a fascinating man, very, very bright. And as you can see very talented.” – Pierre Bergé, President Le Fondation Pierre Bergé – Yves Saint Laurent. When asked about the perfect relationship between business and fashion, Bergé is resolute, “When Yves was sick in hospital, after he was dismissed by the house of Christian Dior and I went to see him, he said you know what we need to do? Create a house of haute couture.” and from there the house of Yves Saint Laurent was born. “I didn’t want to be a business man. Absolutely not. So, of course, I became a business man.” laughs Bergé. He says that their success together was down to one thing, their respect for each others role. “I decided to respect the creation above the business. Creation comes first and business after.” Talking frankly, Bergé claims that although there are certainly talented designers around today, fashion is now all about marketing and not about the metier. Some of the most iconic pieces in fashion history have been created by the house of Yves Saint Laurent. From the safari jacket to the Mondrian dress, each is instantly recognisable. Described as a fashion maverick, in 1966 , he opened the first prêt-à-porter boutique to bear a couturier’s name, Saint Laurent Rive Gauche and it’s there that he worked to create the modern woman’s wardrobe looking to art and history for inspiration. 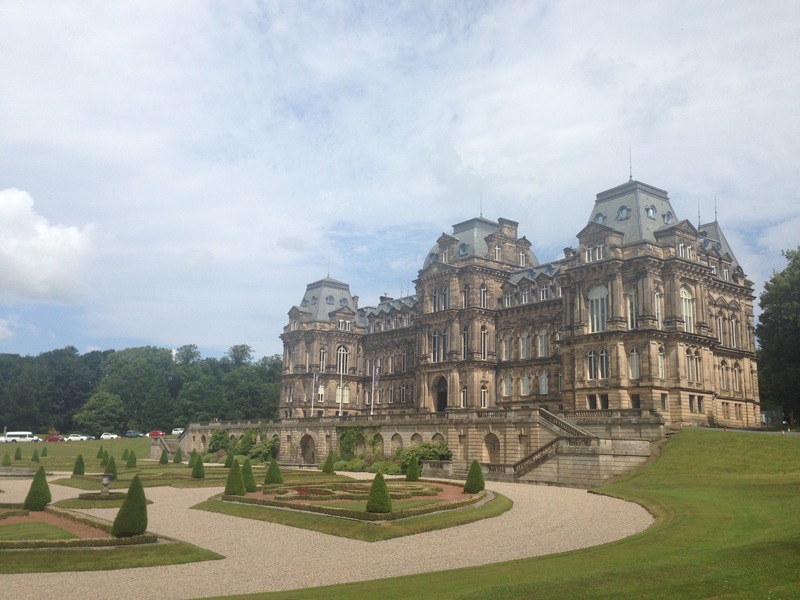 So, why The Bowes Museum and not London? Given the success of Savage Beauty at the V&A some would say that Bergé has missed a trick hosting the first ever YSL retrospective in the North of England in a small market town of 5000 people; “Because they asked” says Bergé, “It’s so very like France, I could be in Paris in this beautiful museum in such a beautiful part of the country, it’s perfect and the weather is also beautiful.” A 17th century style French chateau in sprawling English countryside – it couldn’t be more perfect for one of the last real couturiers to allow the public to breathe in his work. The Bowes Museum, already filled with predominantly French objets d’art, has cleared its existing fashion and textiles hall to make way for the exhibition comprising fifty iconic pieces from the YSL archives including the famous Zephirine dress, created by Saint Laurent during his time at Christian Dior and modelled by his favourite model Victoire Doutreleau in 1958 at Blenheim Palace. The dress was recently rediscovered in storage in the Palais Galliera in Paris and painstakingly restored for this very exhibition – A real coup for both The Bowes and the North East region. There are over 1000 YSL accessories on display too, from hats to earrings and headdresses as well as swatches and buttons. The exhibition is delivered over three rooms on the first floor; room 2 is where Joanna Hashagen, Fashion Curator at The Bowes Museum has used existing items from The Bowes’ fashion and textiles exhibition, to marry YSL’s most recognisable pieces with their historical influences. With the YSL creation as the headline piece in each of the five themed glass boxes, this room in the exhibition is heavily supplemented with period pieces. Room 3 is where the magic happens. In a similar vein to Claire Wilcox with Savage Beauty, Hashagen has created five main themes: Art, Spectaculaire, Transparency, Masculin / Feminin and The Alchemy of Style. The pieces on display in this room are all showstoppers. Put simply, this is the best of Saint Laurent and it’s right here in the glorious North East. From the sheer pieces on display in Transparency, which Bergé says were “truly shocking” to people when first unveiled, to the striking tributes to artists Piet Mondrian and Picasso in Art, each piece has its own place in history and the craftsmanship is undeniable. With embroidery, paillette layering and harlequin patching taking centerstage, it’s hard not to be blown away by the magnitude and importance of this small but perfectly formed exhibition. There are previously unseen sketches, collection boards, toiles, hat blocks and of course, Saint Laurent’s beloved paper dolls on display throughout the exhibition. The dolls were cut from his mother magazines in his teens and he would design outfits for them using paper, giving us a small glimpse at his early genius. I attended the press launch in advance of the exhibition opening and had a chance to chat with Helene Ludinghausen, former Head of Couture for Yves Saint Laurent who told me that “The Bowes museum is absolutely the right place for this retrospective and Yves would have loved it, everything about it.” And I agree, whilst it’s an unexpected choice for an exhibition of this stature, it’s aesthetically and culturally perfect. she also told me that she loved my Chanel boots and McQueen frock but let’s keep it Saint Laurent…..
With the exhibition opening to the public on Saturday, it’s an absolute must for fashion lovers everywhere and for anyone who understands the cultural importance of Saint Laurent in fashion. Go, soak it up and then go again, it’s probably the only chance you’ll ever get to be around such iconic master pieces and it’s well worth it. Such an amazing write up of a great exhibition. I went yesterday and thought it was spectacular. It must’ve been such an honour to meet Pierre Berge and hear him discuss such brilliant work.